With all the buzz about electric vehicles at the recent Detroit North American International Auto Show, the 2006 film, "Who Killed the Electric Car", seems like an old science fiction movie. The idea of the electic car being killed by some grand oil and car company conspiracy is so outdated. It seems almost as silly as those films directing school kids to crawl under a desk in order to protect themselves from nuclear war heads heading at any moment in the school's direction. Last week, NYC Mayor Michael R. Bloomberg announced the results of a study on what City government and other sectors can do to foster the usage of electric vehicles (EVs) and what factors would lead New Yorkers to drive them. The study, developed in partnership with McKinsey & Company, a global management consulting firm, found ways to facilitate adoption of EV technology and heralded a bright future for EVs in the Big Green Apple. In 2008, the New York State Department of Motor Vehicles reported that there were approximately 1,750,000 cars registered in the five boroughs of NYC. Based on data in the new PlaNYC Report, NYC residents will buy 70,000 Electric Cars by 2015. Most of these are likely to replace older cars. This means that in just 7 short years nearly 5% of cars owned by residents in the Big Apple could be either battery or hybrid electric. Solar PV Powered Electric Vehicle Charging Station made with old cargo shipping container in Red Hook, Brooklyn, New York. There are lots of smart New York companies, big and small, who are gearing up to have EV charging stations to service all the new EVs soon to invade NYC. From Brighton Beach through Manhattan and north to the Bronx the electrification of Manhattan vehicles is going to happen faster than we might imagine. Large residential buildings are already starting to add the EV charging amenity. To name a few--the Helena, a rental tower at 11th Avenue and 57th Street, and many of the buildings in Battery Park City, like the Verdesian and the Solaire, have EV charging stations already. California-based Coulomb Technologies has an EV charge network called ChargePoint and is surely to be a big player. They have started to establish themselves on Long Island and in NYC. The New York Times reported that Coulomb installed four EV charge stations for electric cars in a 400-car parking garage at the 569-unit Emerald Green on 38th Street between Eighth and Ninth Avenues. But, it won't just be huge internationally-branded EV charge station chains like Coulomb that will invade NYC a la Starbucks. 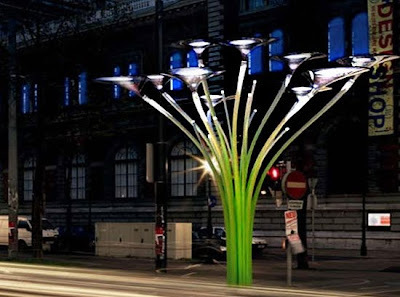 Like local coffee houses that compete with the big corporate chains, there will be funky neighborhood charging points where locals kibbitz while waiting for their EVs to charge up. 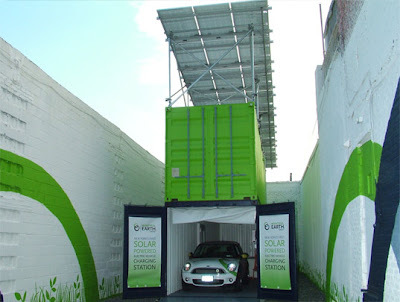 In Red Hook Brooklyn, a group called Beautiful Earth Group (BE) unveiled New York's first solar-powered electric vehicle (EV) charging station which charges its electric MINI E with the help of solar panels on top of an old cargo container. 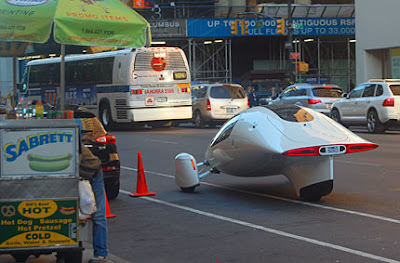 Surely, grandmothers with homes that have driveways in Queens--(first in number of cars amoung the five boroughs)--will be parking their new EV cars under solar PV canopies that they will use to power the EV outings to the local Cineplex with the grandkids. Or, better yet, tell Santa to give electric granny a solar tree to "plant" in the front yard so she can charge her EV and electric lawn mower with it. After all, one must keep up with the electric Jones', and all their green gadgets, next door. Check out below a promo for the 2006 film "Who Killed the Electric Car"